Indigo Lily Crown or Neckpiece: This one-of-a-kind piece can be worn as a crown or a neckpiece. The lilies are dyed with indigo dye and the pistils are made of brass and orange glass. 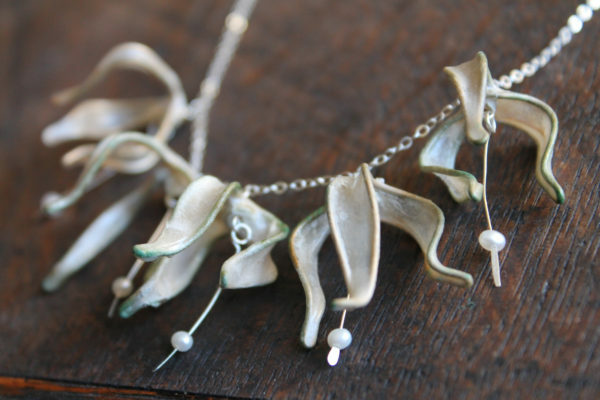 Melanie Brauner’s jewelry is made from abaca paper fibers cast onto metal. First, she fabricates three-dimensional shapes from copper, brass, and sterling silver, and beats abaca in her Critter beater for at least 4 hours, to achieve a beautiful translucency when she casts it. Frond Earrings: Sterling silver with abaca paper dewdrops. Next she dip-casts the metal forms between 2 and 4 times, dipping and drying, dipping and drying, gathering another thin layer of fibers each time they’re dipped into the pulp, until a paper skin is built up. The she adds dye to some of the pieces and seals everything to make them water resistant and durable. Lily Garland Necklace: Brass and abaca flowers with sterling silver and freshwater pearl drops, on a sterling silver chain. Melanie’s inspiration comes from the details you experience when you walk through forests and gardens: moss, rivers, flowers, leaves, chrysalises, dewdrops, gates and bridges, the night sky, insects, spiderwebs, rain…. About our Sponsor: VERSO is a two year old, one woman business in Shoreline, Washington, run by Melanie Brauner. In addition to making her jewelry line, Melanie creates one-of-a-kind art jewelry pieces and artist’s books intended for gallery shows, and she’s a custom bookbinder and box maker. You can buy VERSO jewelry through her website or Etsy shop, and in the Tacoma Art Museum, the Bellevue Art Museum, the Bainbridge Island Museum of the Arts, the Nevada Art Museum, Whitebird Gallery in Cannon Beach OR, Scott Milo Gallery in Anacortes WA, Good Eye Gallery in Los Angeles CA, and a handful of shops and boutiques. Follow Verso on facebook and instagram.